I know I just shared a review of the March crate, but this one was probably the best one we've received so far so I wanted to share it with you guys. It was a feathered friends theme and Marley made a bird costume, bird nest and two eggs. I helped her with the nest and we each painted an egg. 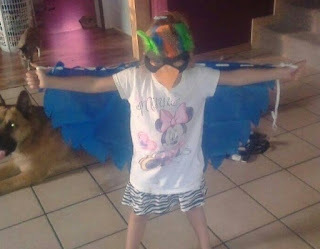 While I was off seeing Wicked, Mike helped her with the bird costume. If you are interested in try out Kiwi Crate for your kiddos just click here. This post was in no way sponsored by Kiwi Crate and I was not compensated for my time or review.